A paper published today in the Journal of Climate finds that the Central Plains of North America experienced multiple severe "megadroughts" [lasting up to 50 years each] during the Medieval Climate Anomaly from 1100-1500 AD. According to the authors, "These ‘megadroughts’ had exceptional persistence compared to more recent events." By comparison, the paper shows that droughts over the past 500 years have been much less extreme. 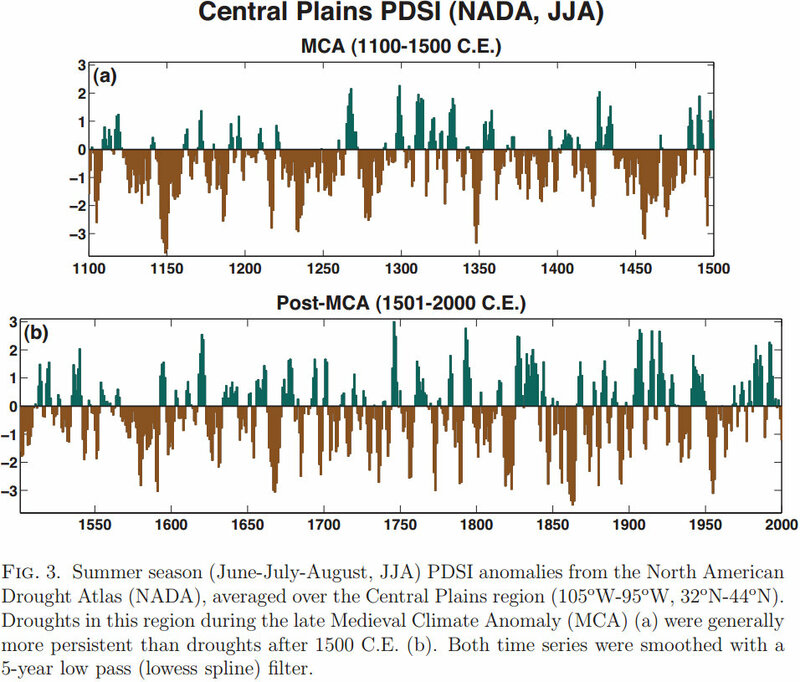 Reconstructed Palmer Drought Severity Index [PDSI] for June-August shows megadroughts of "exceptional persistance" lasting decades [negative anomalies shown in brown] during the Medieval Climate Anomaly 1100-1500 AD. Intensification of North American megadroughts through surface and dust aerosol forcing. 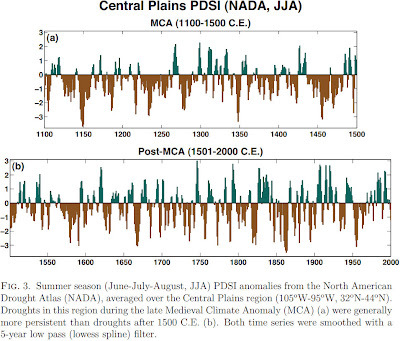 Tree ring based reconstructions of the Palmer Drought Severity Index (PDSI) indicate that, during the Medieval Climate Anomaly (MCA), the Central Plains of North America experienced recurrent periods of drought spanning decades or longer. These ‘megadroughts’ had exceptional persistence compared to more recent events, but the causes remain uncertain. We conducted a suite of general circulation model experiments to test the impact of sea surface temperature (SST) and land surface forcing on the MCA megadroughts over the Central Plains. The land surface forcing is represented as a set of dune mobilization boundary conditions, derived from available geomorphological evidence and modeled as increased bare soil area and a dust aerosol source (105°W–95°W 32°N–44°N). In our experiments, cold tropical Pacific SST forcing suppresses precipitation over the Central Plains, but cannot reproduce the overall drying or persistence seen in the PDSI reconstruction. Droughts in our scenario with dust aerosols, however, are amplified and have significantly longer persistence than in our other model experiments, more closely matching the reconstructed PDSI. This additional drying occurs because the dust increases the shortwave planetary albedo, reducing energy inputs to the surface and boundary layer. The energy deficit increases atmospheric stability, inhibiting convection and reducing cloud cover and precipitation over the Central Plains. Results from this study provide the first model based evidence that dust aerosol forcing and land surface changes could have contributed to the intensity and persistence of the Central Plains megadroughts, although uncertainties remain in the formulation of the boundary conditions and the future importance of these feedbacks.